That I love Asian noodles I think is probably a given. A Vietnamese-style pho (pronounced "fuh") is one of my favourite meals, especially if I have any leftover roast meat to use up. So if you're thinking ahead to Sunday's roast chicken lunch, think how good Monday's supper will be (particularly if you use the carcass to make a stock). 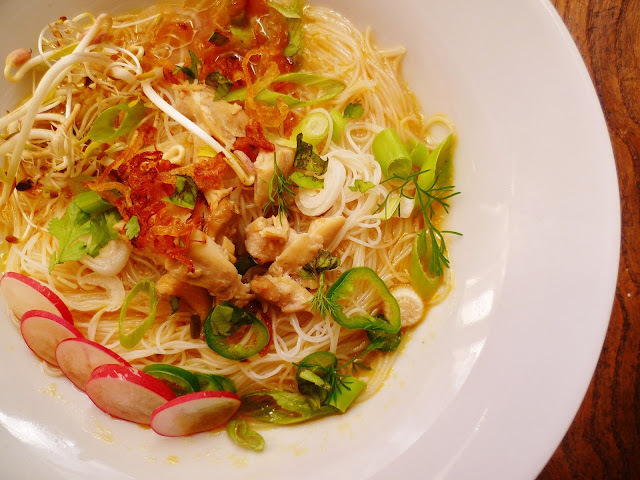 Essentially this chicken pho is a good chicken stock infused with ginger to which you add noodles and a few toppings - the crunchier the toppings the better. They work beautifully with the soft noodles in an aromatic broth. I have included caramelised onions. But if you throw your hands up in horror at the thought of adding fried food, then leave them out. Although to be fair that's the only fat in the dish, apart from the tiny globules of chicken fat that I refuse to decant from my home-made stock. Bring the chicken stock to the boil. Add 3 spring onions, the ginger, garlic and fish sauce. Simmer for 10 minutes and set aside while you assemble the rest of the ingredients. Cook the noodles according to the packet instructions. Drain. Chop the chicken into bite-sized pieces. Thinly slice the rest of the spring onions, together with the chillies, radishes and herbs, keeping each vegetable and herb in separate bowls. Strain the stock to fish out the infusing ingredients. Return to the pan and bring back to the boil. Check the seasoning. Divide the noodles among the bowls. Top with bits of chicken and a dollop of caramelised onion. Ladle over the hot stock. Serve with the lime quarters, letting everyone help themselves to the different garnishes. The trick is to take a little at a time so that none of the ingredients become soggy.